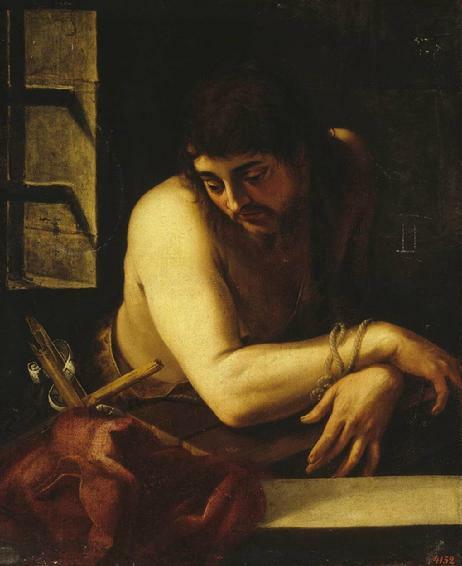 "A Burning and a Shining Lamp"
This painting by Tiziano (top right) reminds me of Athanasius' description of St. Antony the Hermit after his 20 years of solitude: And when they beheld him, they were amazed to see that his body had maintained its former condition, neither fat from lack of exercise, nor emaciated from fasting and combat with demons, but just as they had known him prior to his withdrawal. ...He maintained utter equilibrium, like one guided by reason and steadfast in that which accords with nature. (Athanasius, Life of Antony). 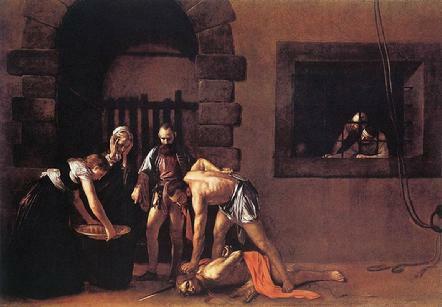 Tiziano also portrays John the Baptist as physically and psychologically whole. But this Gospel passage presents a glimpse into the passion of John in prison: vulnerable, in distress, needing now to know for sure if Jesus is the one to come. And Jesus answers in a Biblical code irrefutable in its meaning: the blind receive their sight, the lame walk, the lepers are cleansed, the deaf hear, the dead are raised, and the poor have good news brought to them. And John comprehends once again, the Word of God. Jesus then upholds John to the crowd as the greatest of all prophets. John is honored as a burning and a shining lamp, a man of deep humility and insight (meditation one) and as the one who baptized Jesus (meditation two). 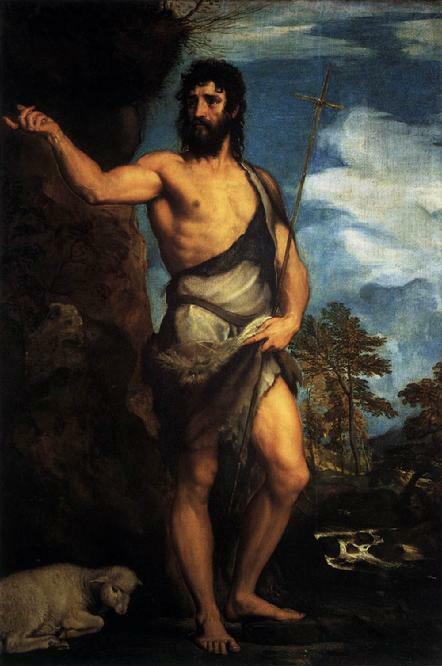 The figure of John the Baptist continually inspires me to embrace the struggle to grow and change and progress along the mystical path of grace (meditation three). He was a burning and a shining lamp, and you were willing to rejoice for a while in his light. How signal a testimony then did John give to Christ? Even to saying that he “was not worthy to loose the latchet of His shoes.” (John 1:16). He confessed that he was but a lamp lighted at His Light, and so he took refuge at His feet, lest venturing on high, he should be extinguished by the wind of pride. So great indeed was he, that he was taken for Christ; and if he had not himself testified that he was no He, the mistake would have continued, and he would have been reputed to be the Christ. What striking humility! Honour was proffered him by the people, and he himself refused it. Men were at fault in his greatness, and he humbled himself. He had no wish to increase by the words of men, seeing he had comprehended the Word of God. there has not risen a greater'. and, what grieves him even more, a sinner with a dead soul. Therefore I say: In every gift, in every work, we ought to learn to look toward God, and we should not allow ourselves to be satisfied or be detained by any thing. Whatever our way of life may be, we must not cease to progress; this has been true for everyone, however far he may have advanced. Above all else, we should always be preparing ourselves, always renewing ourselves to receive God's gifts. renew in me the grace of your baptizing. I miss decorating for the sisters - the table, the advent wreath in the chapel, putting St. Nicholas' golden coins in shoes, making St. Lucy (marzipan) eyeballs. For that matter I miss Advent with my children - secret friends doing little kindnesses for one another, banging on pots and pans and marching around the house singing Godspell's version of "Prepare Ye the Way." I miss my favorite Advent calendars. We're two senior citizens alone in a quiet house. And yet Advent has come to Frogby, too. How is it that the quality of Advent permeates the house, the light outside, the tone of the day? Not just because it is December and the daylight IS extraordinary and muted, as if hinting at glory not immediately available but promised nevertheless. And not just because a few little doors of the Advent calendars fold open, or the prayers and chants and antiphons wind through my mind, in pleasing counterpoint to the rhythms of the day. Or that St. Nicholas arrived on December 6th and filled our wooden shoes with favorite treats. These outward things may be delightful. But something else seems to take place within. Maybe it is that one Advent superimposes itself upon the other, so that I enter a rich Advent continuum like coming home to all the Advents I've ever prayed. This year particularly, my anxieties have quieted, and I've slowed down, not far enough but farther than ever before, contributing to the awareness of the season's anticipatory magic. I almost wrote, “as far a I'm concerned it could stay Advent forever,” but, intrinsically impermanent, the point of Advent is preparation for the world turning upside down and accepting what will come. It's like saying, “I think I'll just stay here in Purgatory, thank you, it's quite nice enough.” Therefore... even more reason to stay in the moment, watching, waiting. So here's a word from Meister Eckhart about always preparing.